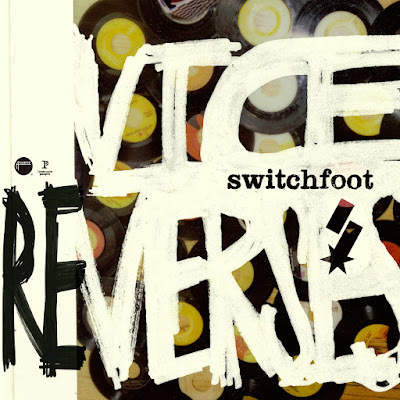 Switchfoot made a scene last fall with the release of their highly anticipated album Vice Verses. Already, the album has seen two chart-topping singles, “Afterlife” and “Dark Horses,” not to mention the fan-favorites that include “Selling the News” “Thrive,” and more. To say the least, the GRAMMY-nominated band has definitely been well received by fans. Now, in honor of Record Store Day today, Switchfoot releases an exclusive remixed CD, aptly titled Vice Re-Verses. These remixes are sure to entice the listener, as fresh life is breathed into each new take. “The Original,” mixed by Paper Route’s JT Davis, opens up the EP. This version is more chaotic than the original, but Jon Foreman’s perfect vocals are left mostly untouched. “Selling the News” has a synthetic electronic feel to it. I love this amazing change, though I was a bit unhappy with the fact that most of the verses were cut out. Not completely, but since the verses were my favorite part of the original from Vice Verses, I did miss those fast-paced half-rapping lyrics. Overall, however, this track was made amazingly better. Next follows the definite highlight remix – “Blinding Light” mixed by the one and only Adam Young, AKA Owl City! Adam adds his futuristic space feel to this track, making it almost breathtaking and freeing. That seems to be how Owl City’s music is, so hearing him add that twist to Switchfoot’s music was quite cool. For the most part, not much was done to “Dark Horses,” just a new drumbeat which is accentuated in certain parts. The vocals also are muffled, and there are guitar spurts here and there. The track also closes and reopens with a futuristic instrumental that the original does not have. “Vice Verses” is still slow as the original, but does have a booming drumbeat. With a nice piano addition, “The War Inside” concludes the EP with electronic and bassy drums. It seems to end a bit prematurely, but is a great remix. Switchfoot fans will definitely enjoy these wonderful, strong remixes. The electronic and futuristic remixes make these fan-favorites and radio singles come alive. You can pick up this CD today, and be looking forward to the digital version, available on May 1st, complete with a fan-created remix of “Afterlife,” Switchfoot’s current single.